Happy Halloween! Although I don’t really celebrate and get dressed up, Halloween is one of my favorite holidays because I love watching others display their creative side. Another reason is obviously the candy. When I was a kid, we went trick or treating only a handful of times because it was difficult for us to trick or treat in our neighborhood. Whatever candy I did get, I would categorize my candies by type; chocolate, fruit candies, and the cheap stuff. My favorite chocolates were Milky Ways, Snickers, and plain Hershey bars. In the fruit pile, I’d have my Skittles, Starbursts, Smarties, and lollipops. Finally, the cheap pile was a compilation of no name candies; like caramels, those strawberry candies that no one seems to like (except for me), caramel cremes, and peppermints. We got lucky because we never got raisins or apples, except one time, I do remember getting a few pennies in my pumpkin. Then of course, I had my favorites that I never got through trick or treating; Peeps and candy corn. These two faves are a common unpopular opinion. I have heard many people say they hate Peeps and candy corn, mostly because of the taste. I love marshmallows, so Peeps are a given; and candy corn is the quintessential Halloween candy, so no hate there. But my favorite type of candy corn to get is Autumn Mix. To me, Autumn Mix is the best of all three worlds; candy corn, mellowcreme pumpkins, and Indian corn. Most say they hate candy corn because it’s too sweet. It’s pretty much concentrated sugar with a slight vanilla taste. Candy corn’s distinct taste is actually thanks to honey, which makes this sugary treat even sweeter. As we got older, My sister and I would buy our own candy. We’d share a bag of Autumn Mix, where she’d take most of the candy corn and pumpkins, and leave me with all of the Indian corn. I honestly don’t get the Indian corn hate. It was a welcome taste change when gobbling up pieces of monotonous candy corn. It’s the only one that is chocolate flavored, although the signature candy corn taste is still there. 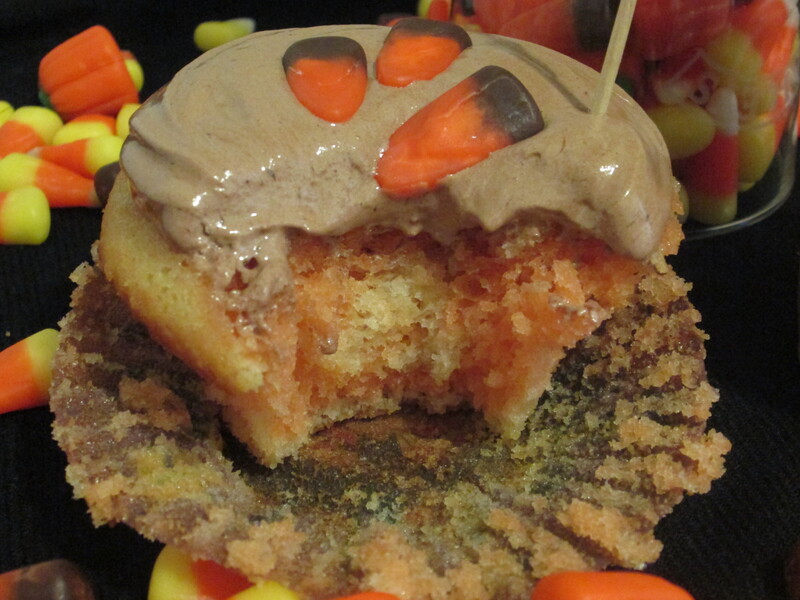 Indian corn quickly became one of my favorites, and is one of the reasons I decided to make these cupcakes. I wanted to highlight one of my favorites, and Indian corn is the underdog of all Halloween candy. 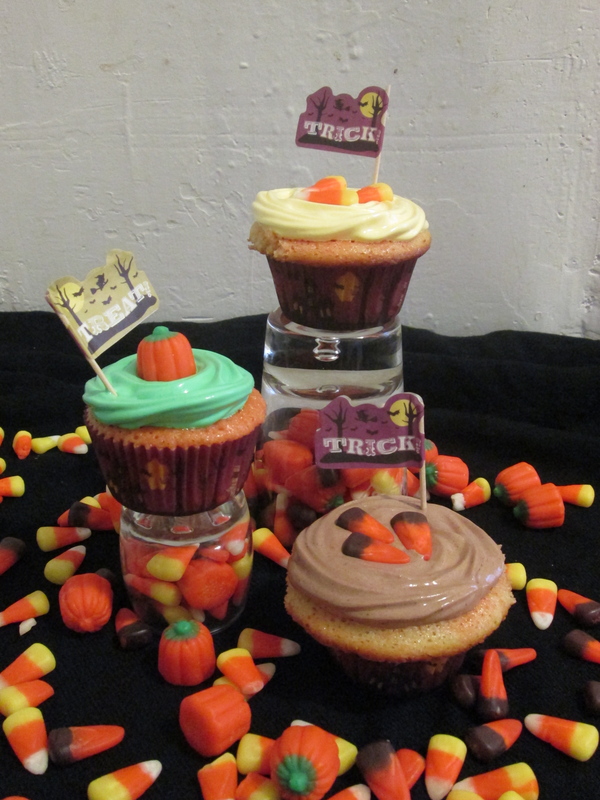 These cupcakes are an ode to Autumn Mix, and my love for super sugary treats. I used The Kitchn’s recipe for Quick Yellow Cake for these cupcakes. I tinted the batter according to the candy corn; a small amount of untinted batter on the bottom of the cup (for the candy and Indian corn), and orange for the corn’s bodies and for the mellowcreme pumpkins. 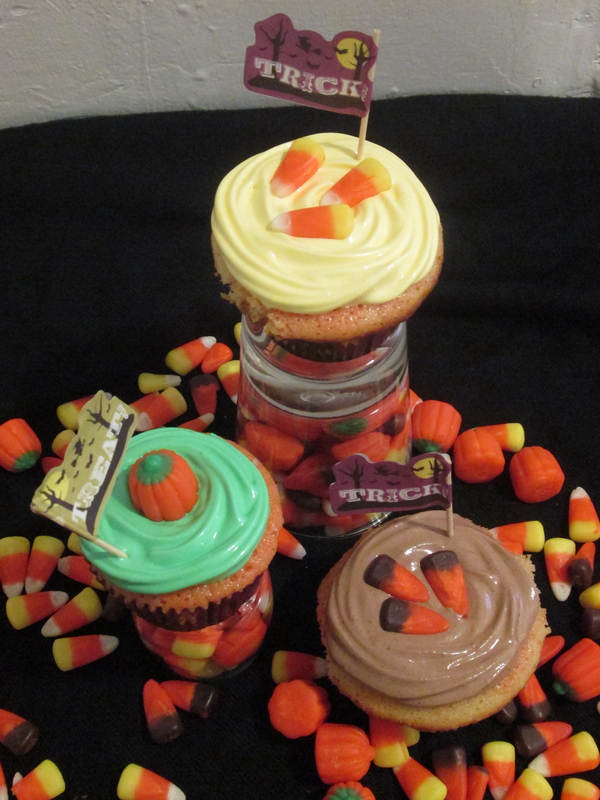 To finish the color schemes off, I frosted them with seven minute frosting, one of my favorites, tinted accordingly; yellow for candy corn, green to top off the mellowcreme pumpkins, and a chocolate flavored one for the Indian corn. The chocolate frosting was important for me to get right for two reasons; I wanted to get the Indian corn correct with it’s chocolate flavor, and because I had yet to see a chocolate seven minute frosting anywhere online. The cakes came out really moist and yummy! 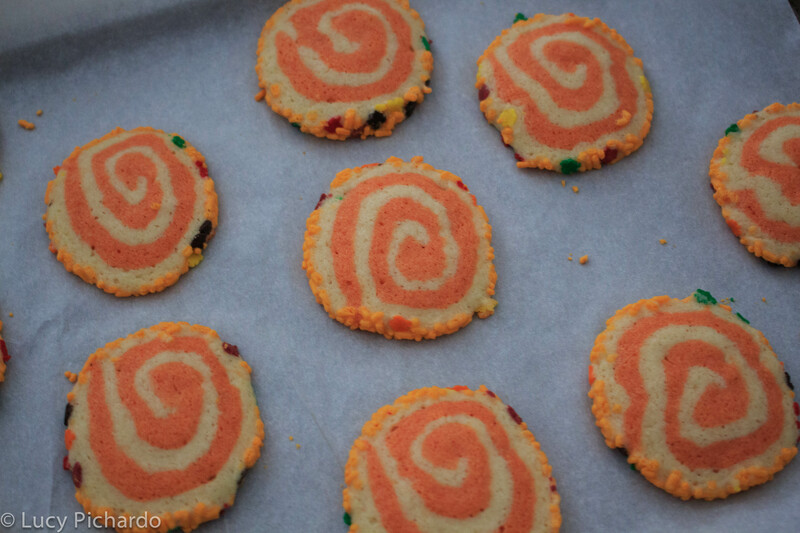 Although I wanted a layered effect with the candy/Indian corn ones, it sort of tie-dyed instead; which was a pleasant surprise. Another surprise was adding some cocoa powder to a portion of the frosting. It tasted really good with the cupcakes, something I was initially worried about. I think that melted chocolate would probably work best for a chocolate seven minute frosting. Please enjoy yourselves this Halloween! Just remember to stay safe! Soften your butter, and preheat the oven to 350°F. Line your cupcake pans with cupcake liners. Use a hand mixer or stand mixer to beat the softened butter and sugar together until fluffy and light. Add the eggs, one at a time, and beat until fully incorporated and light. Combine the flour, salt, baking powder, and gently beat it in, alternating withthe milk and vanilla. Beat everything together on low for 30 seconds, then high for 3 minutes. Pour some of the batter, about a tablespoon, into 12 of the cupcake liners. 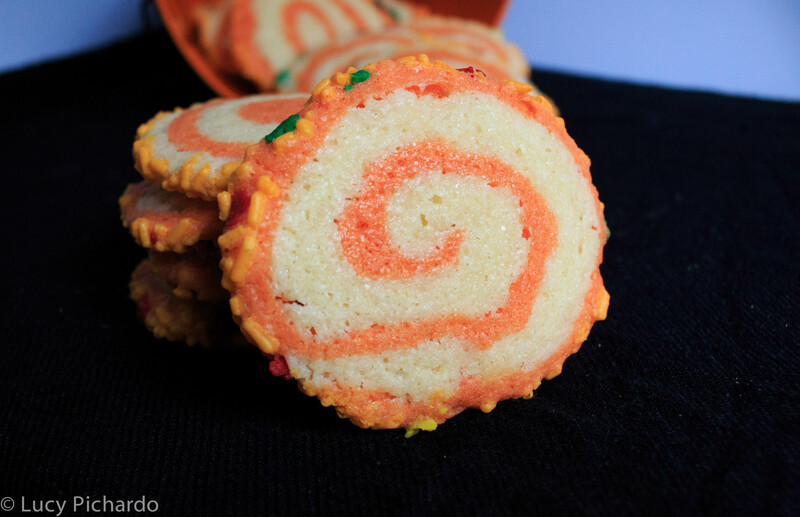 Tint the batter orange, using food coloring, and fill all the liners about 3/4 of the way up. 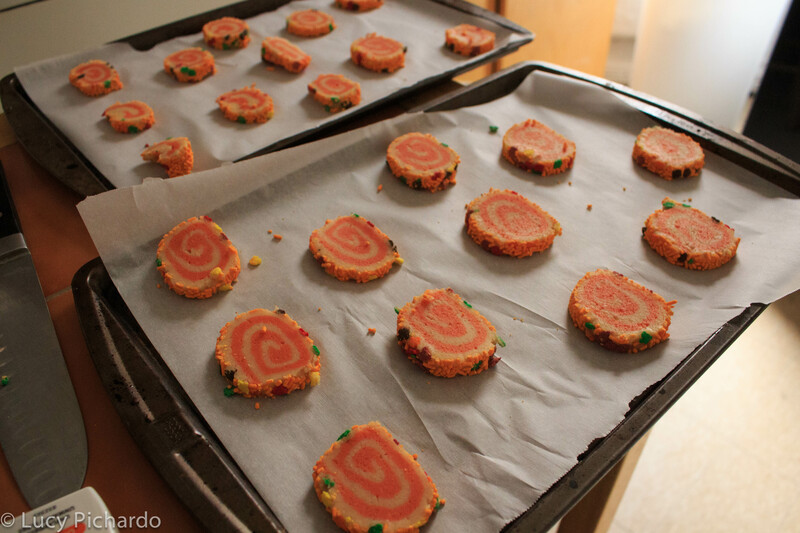 Bake the cupcakes for 18 to 22 minutes, or until the tops spring back slightly when pressed. Let cool in the pans, on wire racks for at least 10 minutes, then remove from the cupcake pans onto racks to cool completely before frosting. In a large heatproof bowl, combine the sugar, water, egg whites, cream of tartar, and the pinch of salt. Beat with an electric mixer set at low speed for 30 seconds, then place bowl over your double boiler. 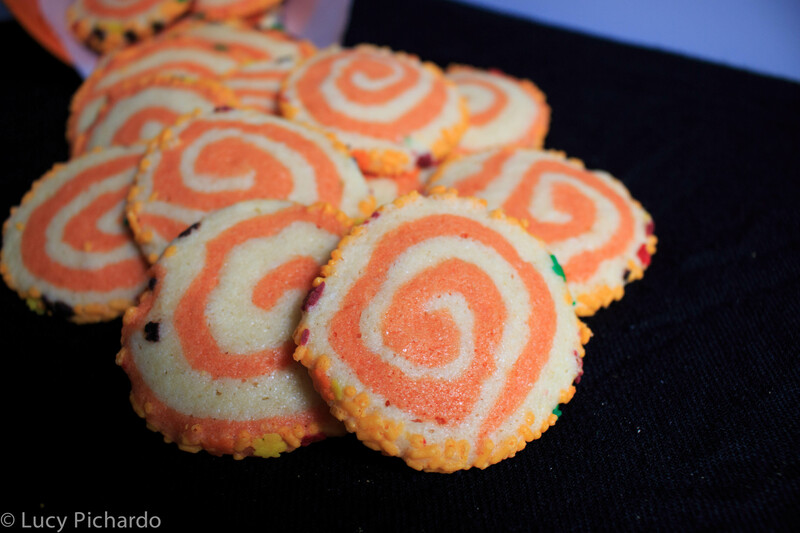 Beating at high speed, cook the frosting for about 7 minutes, or until it’s stiff and glossy. Remove it from the heat, add the vanilla, and beat an additional 2 minutes. Do not over fill the cupcake liners! I kind of did (heh), and they overflowed. 3/4 of the way works perfectly. To make a double boiler, place about 1-2 inches of water in a pot and set to a simmer. Do not boil the water and make sure your bowl does not touch the water! The steam coming off the simmering water gently cooks the frosting. For the chocolate frosting, I folded two tablespoons of cocoa powder, sifted, into about a third of the frosting. Melted bittersweet chocolate can possibly work as well.